Please welcome Timeless designer Samarra Khaja to the blog today! 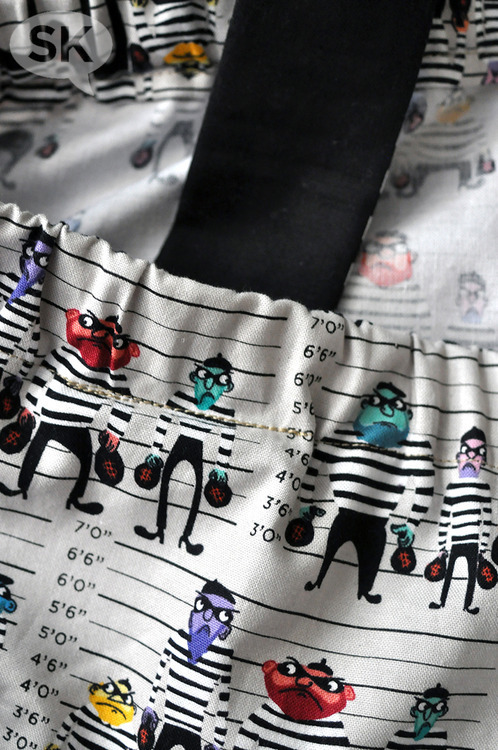 She’s sharing a fun project you can make with her new Cops & Robbers fabric. Take it away, Sammy K! I’ve been really into simple clothing sewing lately, especially the Japanese aesthetic of straight stitch clothing patterns. I despise uncomfortable clothing. You know, the type that makes you walk, stand and behave much like a cat that’s been unwittingly subjected to playing dress up—slinking around and contorting yourself as a way of coping with the claustrophobic material that’s encasing you. Plus, I like a cute top that still lets me unabashedly take a second walk to the buffet spread. No shame, people, no shame. Black & White Stripe-C8109: 2 1/2″w x your hip measurement plus 8-10″. No-roll elastic 3/4″w x your underarm torso measurement. 1. 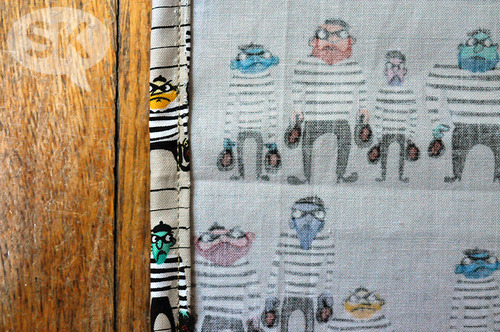 Hem each 24″ side of the Cops ‘N’ Robbers rectangle by turning the fabric edge under, pressing, turning it under again, pressing again, and topstitching. Because the fabric runs the full width of a bolt, these are selvedge edges, so hemming can be as detailed or minimal as you choose. I did a mini 1/4″ folded hem on these edges. 2. With fabric rectangle laying flat, place elastic along the top edge of your fabric, approx. 2″ down from the raw edge. 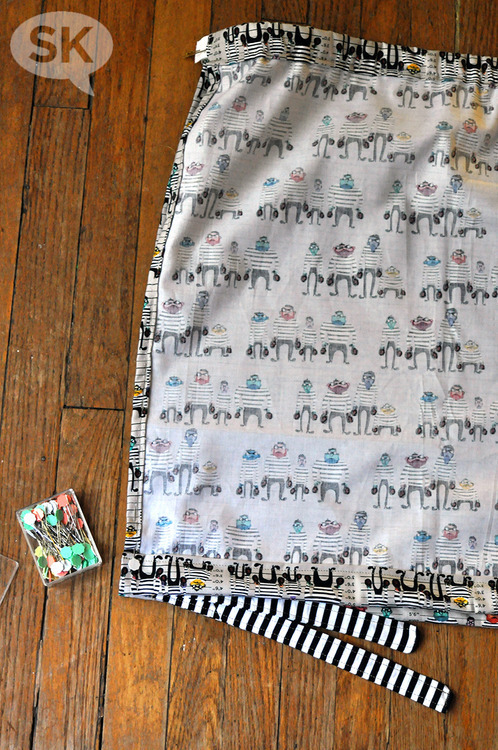 Fold the fabric down and over the elastic, to create a channel for it to sit within. Pin in place, sew and iron flat. 3. Leave the elastic uncut at this time and pin each end of the elastic in place so they don’t disappear into the channel. You will customize the length needed to suit your body size later. Set aside. 1. 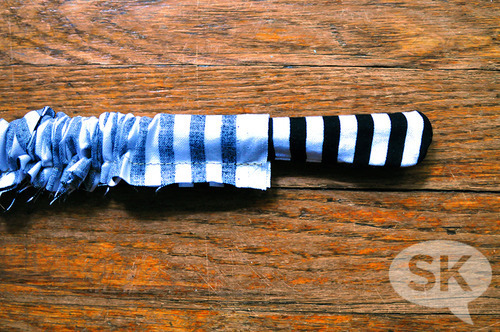 Fold black & white striped fabric strip in half face-to-face and lengthwise, ensuring stripe pattern aligns. Pin in place. 2. 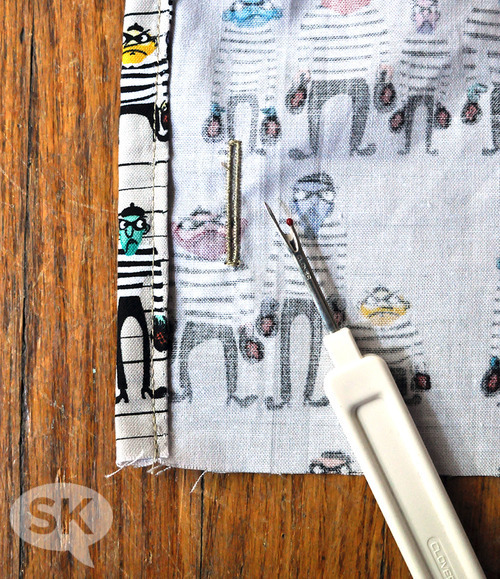 Using a 1/4″ allowance, start at one end and sew it closed. 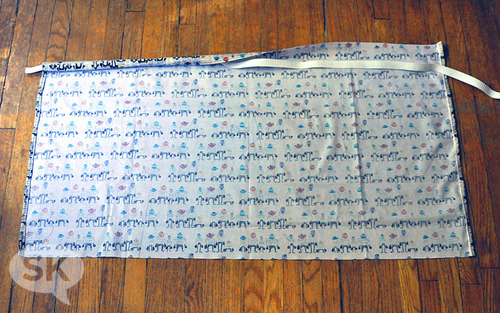 Continue sewing along entire length, leaving other end open. 3. Trim off excess fabric at corners and flip entire tube right-side-out. 4. Iron waistband flat and topstitch 1/8″ all the way around it. Set aside. 1. 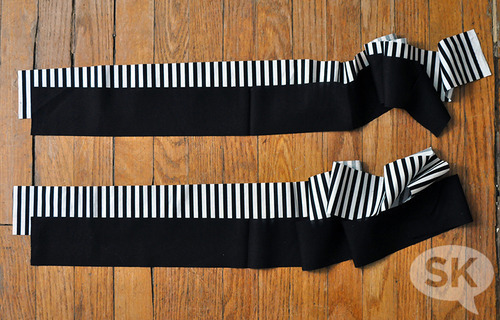 Taking one length of striped fabric and one of solid black, place them face-to-face, aligning all edges, and pin in place. 2. 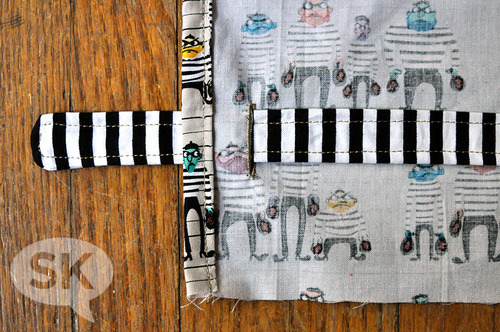 Keeping one end open, sew down one length of strip, using a 1/2″ seam allowance. 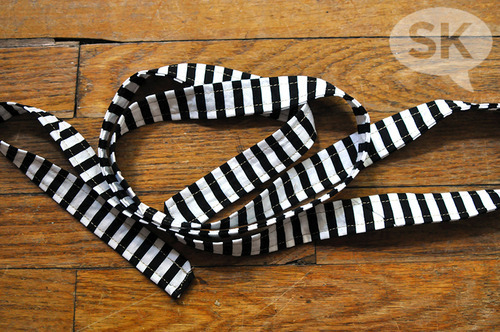 Sew a diagonal ‘ribbon cut’ on the far end, then sew up remaining length of strap. 3. 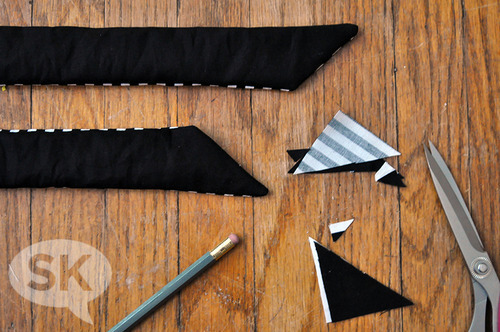 Trim off excess fabric at corners, flip each strap right-side out and iron flat. 4. Repeat with second strap, ensuring the second diagonal end mirrors the first. Set aside. 1. The waistband tie will sit within a channel along the bottom of the body fabric, similar to the one created for the elastic top. Before sewing this, two buttonholes will be created, so the ends of the ties can hang nicely from the side seam area of the body. 2. To create the buttonhole, find a button of similar width to the finished width of your waistband tie. 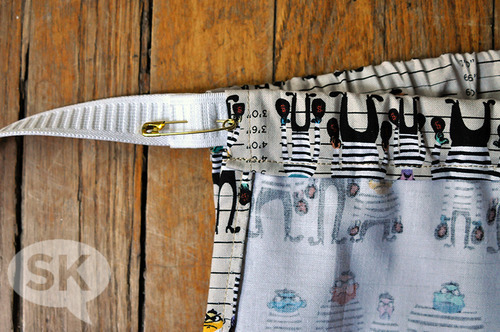 It’s not crucial the button be the exact same size, as the fabric tie will still easily slide through it. 2. Measuring in 1″ from the side edge and 2 1/2″ up from bottom edge, mark the buttonhole width. Sew corresponding buttonhole in this position. Repeat on opposite side of fabric. 3. Slip finished waistband tie through both button holes, so ends stick out on right side of fabric. 4. With waistband in place, roll up bottom edge of fabric to create a channel for the waistband tie to sit within. Pin in place and sew. Iron flat. 5. Take entire body fabric and wrap it around your torso, wrong side-out, to determine how tight/loose you want your elastic band to be. As you’ll be having straps, this elastic should be more for comfort and less for anti-gravity powers. Once you’ve adjusted it to suit your body, pin the two ends of elastic together. 6. Sew up the body side seam, incorporating the ends of the elastic while also ensuring that you do not catch the waistband ties in this seam. 1. Customize the strap placement to suit your personal taste. 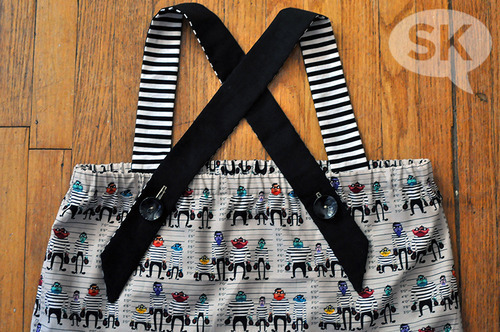 Put the newly assembled body on and, with the help of a mirror or a crafty friend, pin each strap in place, ensuring they are symmetrical and evenly positioned from one another. 2. 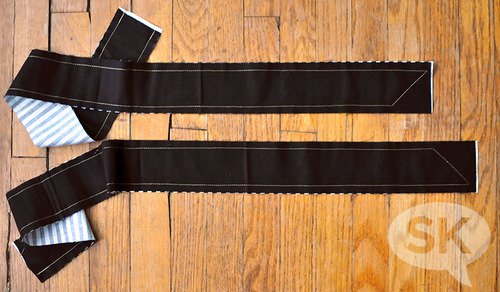 Fold each strap’s raw edge in on itself, so they will get incorporated into the stitching. Topstitch each strap to the body, ensuring you leave the body fabric gathered evenly; don’t pull it tight or flatten it out. 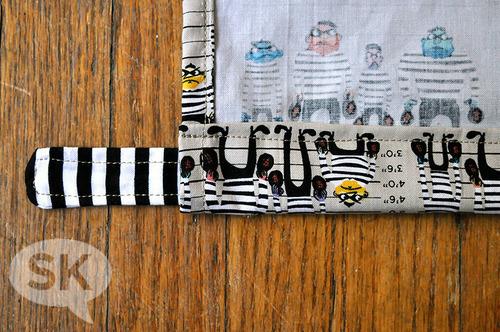 This topstitching should be done directly along the elastic channel stitching line, so they blend together. 3. Once the straps are secured to the front of the body, crisscross the straps on the back and pin them symmetrically from one another. You may need to put the top on again to customize your fit. Position the two 1″ buttons in place, just below the elastic channel, and confirm you like the overall look. 4. Once the positioning is to your liking, make a pencil mark on each of the straps where a corresponding buttonhole will be made for each of the two buttons. 5. Carefully move the straps out of the way, leaving the buttons exactly where you placed them. 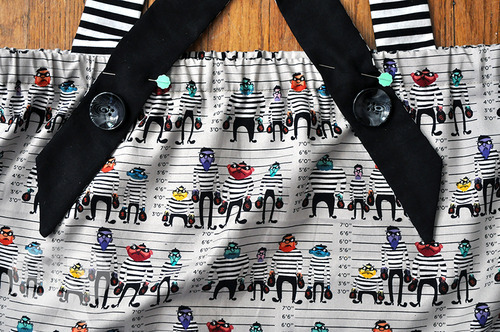 Sew each button in place to the back of the body. 6. 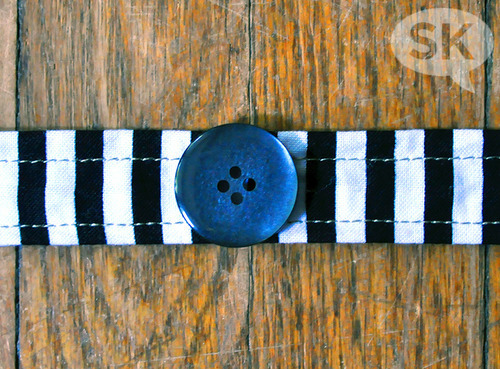 Sew buttonholes where you marked them on back of each strap. Use a spare third button for measuring the buttonhole length, or simply adjust your buttonhole foot to match the 1″ button measurement. 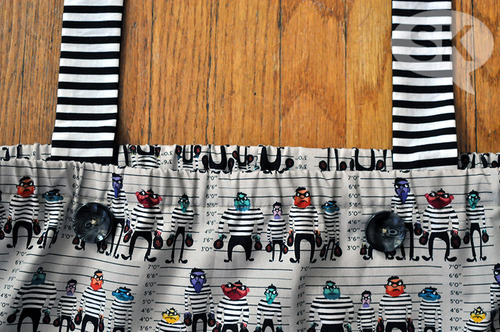 Your Cops ‘N’ Robbers Crisscross Box Top (say THAT 10 times fast!) is now done! Pair it with jeans or a skirt. For a twist, put it under a tank top or thin long-sleeved shirt for a fun layered look. Wear it with the waistband tie cinched or loose, your choice! Being surrounded by a bunch of criminals has never felt so good, plus, unlike them, you have a clear conscience. Law-abiding and fashionable? Case dismissed! It’s a look I’m hoping you’ll “line up” for. Hardy har har. Samarra Khaja is an artist, illustrator, licensed textile designer and proud lefty. She once gave an art history lecture at the Texas Medieval Conference about representations of the Virgin Mary in medieval European apse mosaics. She also assumes everyone else’s high school experience included an annual toothpick bridge-building contest that they fell over themselves to participate in, much like she did. See more of what inspires her at Samarrakhaja.tumblr.com and follow her on Instagram. Also, hold onto your hats, fine people, because she’s currently working on her first book! Halloween Fabric Pumpkins and Fabric Bowl Tuesday Teaser: Quilt Market Edition!